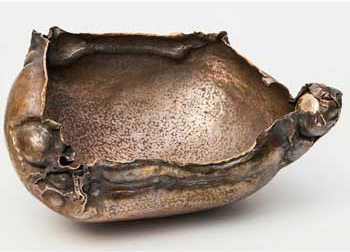 Long-time Rowboat Gallery exhibitor Greg Wilbur, who works primarily with copper, brass and silver using the traditional hammering and annealing technique of “raising” to create sculptural forms, has introduced us to three other outstanding Northwest artists who also work with metals in various artistic and functional applications, interpreting and extending traditional metal-working techniques. Siberian-born Arnon Kartmazov served an apprenticeship with the legendary Uri Hofi in Jerusalem, and continued his training in Japan and Okinawa learning traditional knife and sword making. He moved to Portland in 2000 and is now the creative force behind Portland’s Bridgetown Forge, where he fashions beautifully-designed knives and other functional steel work, as well as powerful sculptural forms. 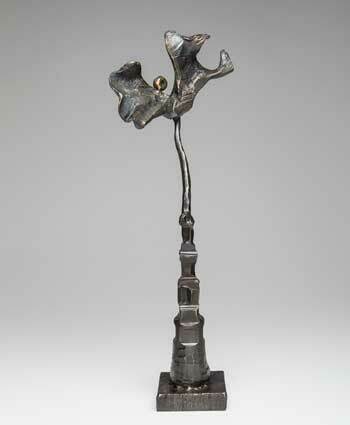 Our other featured blacksmith, Nitzan Lilie, also brings extensive international training and experience to his art. Growing up on a small farm in Israel, he, like Arnon, was first introduced to blacksmithing in that country. 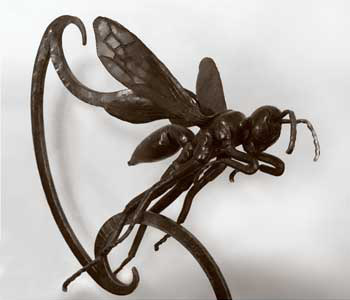 Continuing his training in the Czech Republic and Corsica, Lilie eventually moved to the United States in 1998 and worked for eight years at Austrian Handcrafted Iron in California, further expanding his understanding of the artistic and technical possibilities of his craft. After moving to Portland in 2012, he soon connected with Kartmazov, who offered him shop space at Bridgetown Forge where Lilie is now basing his blacksmithing business. Like Kartmazov, Neskowin artist Grayson Malone draws upon the Japanese aesthetic tradition of Wabi-sabi, which explores the beauty in transience and imperfection. Coming from a background as a construction contractor working in large-scale steel and concrete forming, Malone began experimenting with mixing powered metals into concrete to create rich surface effects. 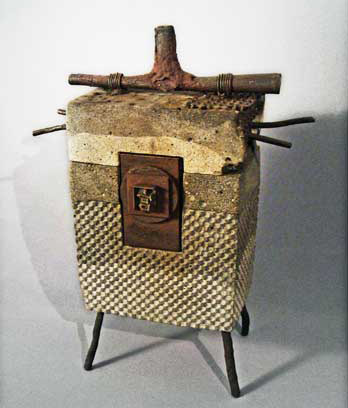 Over the last 20 years, her sculptural work has evolved into provocative objects combining cast concrete with iron artifacts, discarded machine parts, and other found metals.